Buy Old Fashioned Peanut Brittle! Thank you for your support over the last several years. We appreciate your love of Nana’s Candy peanut brittle. I'm sorry to tell you that Nana's Candy will no longer be available until further notice. I hope to offer my peanut brittle again in the future when my circumstances change, but until then, I wish you all the best and thank you again for your patronage. Special Instructions: If you'd like me to include a gift card with your order, please include the details in the box for "Special Instructions." Ready to try our new packaging and pricing? Pearl and Black with a beautiful oval window or Red and Green with a very holiday-themed Christmas tree window. All packages come sealed with a gold bow for your Holiday Gifts! Select from a 15 oz package (in Pearl color only), a generous 9 oz size, or choose the 5 oz personal portion. Please Note: Orders made on or after December 20th are not guaranteed to arrive by Christmas. Orders are Priority Mailed and all efforts are made to send your gifts and personal orders out as quickly as possible. Hurry and Order before it’s too late! If you're one of those people who believe everything tastes better with chocolate, I've got great news for you! 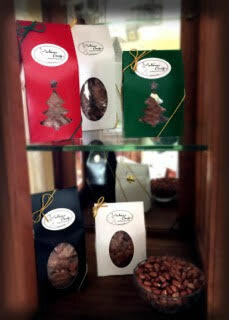 You can buy Nana's Peanut Brittle drizzled in chocolate and made especially for chocolate lovers. Want more than one? Add your quantities when you arrive at Paypal. Maybe you'll want to add an extra tin for a friend! The shipping charges will be added to your order based on your selections and address after you finish shopping. Nana taught me to make her Peanut Brittle when she was 91 years old. It is true, old fashioned candy like you had when you were little. So easy to eat and has that wonderful roasted peanut taste. Light and melts in your mouth. Eating this old time favorite brings back the best memories! Although we regret that we cannot accept any standard international orders at this time, we DO post to US Military Boxes. Every Christmas, Nana sent us a box full of candy in beautiful tins. My favorite candy was the Peanut Brittle. It always came in the largest tin and never lasted more than a day! To carry on that tradition, that same delicious peanut brittle is available for you. Every step of my Nana’s recipe is followed and every batch tasted to ensure this delicious candy is the same as she made. Family, friends, and customers, all agree, it is the Best Peanut Brittle on the market, and delicious to the last crystal. Thank you for buying my Nana’s Candy! I have loved my peanut brittle every single year, but I just have to say my batch this year was a real eye-opener. It was so very yummy! I've always eaten it at least a couple of weeks after it was made due to the long trip my batch makes to Australia, but this year I suspect my batch was much "fresher" as I am so near Virginia looking after my dad. I could hardly stop eating it. Thanks again for such a great product. It's truly mouthwatering for those of us who love brittle. Chocolate Drizzle Brittle is Amazing! Every year at our dental office we give out Holiday gift bags to our local specialists and personal friends. 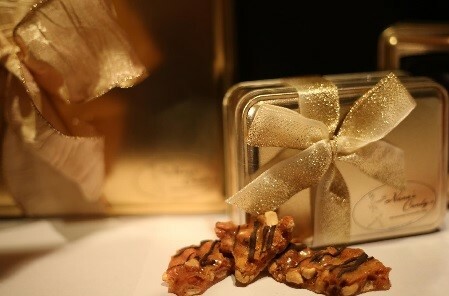 This year we added Nana's Chocolate Drizzle Peanut Brittle to our gift bags! The gold tins with purple ribbons were made to fit our color scheme and were just perfect! Nana's also sent us an extra box as a treat for out dental team. It is gone! Thanks Nana's for the beautiful and tasty gifts. Anyway, I was thinking of another way to describe your "light and airy peanut brittle" for those who have never tried it. Some people may be familiar with "angel food candy" or "honeycomb candy" which is very similar in taste and texture to the brittle part of your peanut brittle. It melts in your mouth! Thanks again for another delicious treat. All the best for 2015. Nana's Candy Light and Airy Peanut Brittle is absolutely the best. I normally do not like peanuts in any type of candy, but one bite of this peanut brittle and I couldn't stop eating it. It tastes so fresh and I love the high quality peanuts. I do however have trouble getting as much as I want because my husband also loves it. This peanut brittle is a gift that will always be appreciated. Just make sure to keep some for yourself. Nana's Candy Peanut Brittle is soooo good I have a hard time sharing. I'm very glad the peanut brittle season is upon us. best peanut brittle-really it is! this is the best peanut brittle I have ever tasted. I love that the recipe came from your "nana" and that you make it and package it just like she did. a peanut brittle that will not break your teeth and tastes so good it is hard to stop eating it! And now people all over the world are able to enjoy it. Light and Airy Peanut Brittle is Awesome! I didn't know how much I liked peanut brittle until I tried Nana's Candy Light and Airy Peanut Brittle. It was sooooo delicious that I immediately had to order some to give as Holiday gifts. The peanut brittle comes in a decorative tin that is perfect for gift giving. Nana's Candy has become a holiday tradition for me that I look forward to every year. Keep cooking, Terri! My family and I love Terri's peanut brittle. Very satisfying for a sweet tooth! I also love the fact that she uses her grandmother's recipe -- all natural and made with love. If you're trying to find the perfect gift for teachers, neighbors, co-workers or a treat for yourself, look no further! This is the best peanut brittle I have ever tasted! it is so addictive, you have to be careful!!! Great job Terri! The peanut brittle arrived in Australia safe and sound on Dec. 10 - pretty fast, I thought! It handled the trip well with only a small amount of breakage (crumbs) - which were still yummy regardless of their miniscule size. That never stops me! The peanuts tasted fresh and the brittle was NOT stick to your teeth chewy, but light and airy just as you described. The peanut brittle was a real treat for me and quite addictive as I couldn't stop eating it last night and paid for it on the scale this morning. :) Oh well, it's Christmas time!!! Thanks again for sending it. I really loved it! I'm so glad he liked it! Great idea on the almonds as well. Peanut Brittle Gets Good Reviews! Here's an extra idea for you, too. Apparently one of my sisters also bought my dad some brittle from somewhere (who knows where). I guess it was Almond Brittle and he told me that it was really yummy too - a different flavor than peanut brittle, of course, but a nice change. Not sure if you've ever made almond brittle, but it might be worth considering to add it to your product line.